Right, cue up the immature jokes. It’s time to learn to deal with a stuck nut. HPL, or High-Pressure Laminate materials are becoming more commonplace in guitar construction. Martin Guitars, in particular, have a line made partially, or almost completely, from HPLs. As a guitar construction material, there are a lot of advantages. But, in order to go into this with your eyes open, you should be aware of one disadvantage. The saddle slot in some bridges is quite close to the front edge. In an ideal world, this might not be too much of a problem because, even though there’s a lot of tension from the strings, most of that is ‘downwards’ towards the bottom of the bridge. Of course, it’s not an ideal world and, even though most of the pressure goes down, there’s always some that’s trying to tip that saddle forwards too. Things like the strings ‘biting’ into the saddle and actually pulling it forwards as you tune up can add to the problem. And sometimes the bridge gives way. Like this. Now, I could just smooth off the fracture line and glue in a new piece but I don’t want to trust the glued joint to take that strain. It might be fine but I want to give this repair as much of a chance as possible. So, I’m going farther back into the saddle. My plan is to remove wood to the back of the saddle slot. I’ll glue in some new wood and then re-rout a new slot into that new wood. This way, the glue-line won’t be taking the strain. You can see what I mean in the sketches below. So, below is the bridge with the wood removed. I’ve sloped a section from the front of the bridge to the back, bottom corner of the saddle slot. You can see the (slightly out of focus—sorry) shape of the piece I’ll be glueing in. By the way, that’s just a thin piece of sheet brass that’s taped down to the guitar. It’s there to protect the top as I work on this. The photo on the right below gives you a better idea. I clamped a block in place near the front of the bridge. The new bridge piece will bear off this and, as I clamp it down, this new piece will ‘wedge’ into place against the block. I can now get good clamping pressure in all the right places. Yay. Once done, it’s just a matter of shaping the glued-in wood to the right profile and routing a new saddle slot. I decided to make a new saddle too. The old one was actually an un-radiused classical saddle and it was made from a pretty soft plastic (the strings were digging in as mentioned above). A nice bone saddle will sound, play, and wear much better. Hopefully, there's a long life ahead for this guitar. Glued inside the top and back of your acoustic guitar are braces. These are wooden support beams* that provide strength to what are, otherwise, relatively thin pieces of wood. Sometimes a brace can become loose. This could be because the guitar gets a knock but, often, some or all of the glue can just fail for a variety of reasons. A loose brace can be a pain. 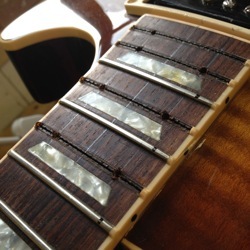 If part of the guitar isn't properly supported, it can pull and warp in unpleasant ways. That's generally not good. 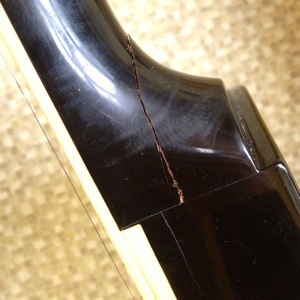 In addition, one symptom of a loose brace (and frequently the one that leads to its being discovered) is a nasty buzz or even a rattle when some or all notes are played. Often this buzz is located around a certain note (a tone or so either side) as the loose brace vibrates in sympathy. These can be an incredibly frustrating thing to track down. Sometimes you'll get lucky and be able to see the gap between brace and top/back (like in the photo at the top—the shadow beneath is clear) but, more often, you'll end up, up to your elbow in the sound-hole, poking at joints with a feeler gauge, trying to find a tiny gap. It's a real pain. When it's found, the gap should be cleaned and the old (failed) glue removed. Then, fresh glue is worked underneath the brace and the repair is clamped up to cure. This sounds straightforward until you try doing it, at the limit of your reach, blind (or, with an obscured reflected image in an inspection mirror). Not so with this one, though. These are back braces and they're relatively easy to get at. This particular guitar did actually get a knock and has had a previous repair for a back/side separation. I can't be certain that these braces were knocked loose at that time but it seems likely. Maybe not, though—benefit of the doubt for the previous repairer. You can clearly see the feeler gauge poking under the braces in the photos. The blue tape is something I've put in, by the way. It keeps the mess down when working glue under the brace. Once there's a good smearing of glue in there (and it needs to be worked well under to get a good joint), a bit of a wipe up, and then it's clamped (see below). The little scissor-jack thing is a god-send for these jobs—it gives decent clamping pressure and I can wind it up from outside the sound-hole. On this particular instrument, this has to be repeated a few times as I found four loose ends. But not any more more. All re-glued and sorted. *I think 'beam' is the correct structural term for guitar braces but any engineers can feel free to correct me. Beam tends to make most people think of massive steel joists, however, while guitar bracing tends to be a little smaller. And wooden. So we've looked at a neck repair with an overlay for reinforcement. 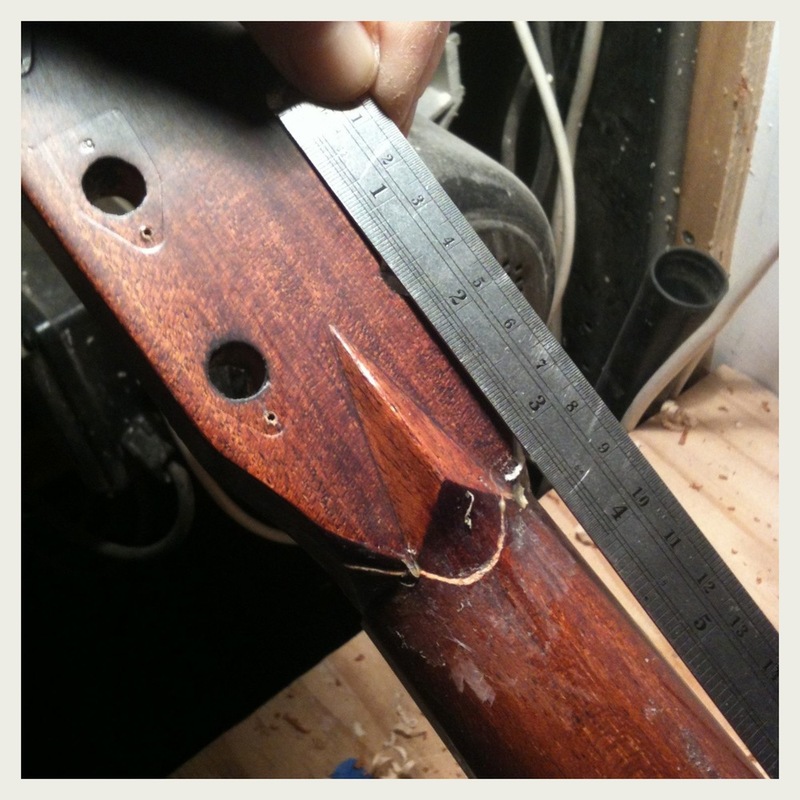 Let's have a look at the other main method of reinforcing a broken headstock: Splines. 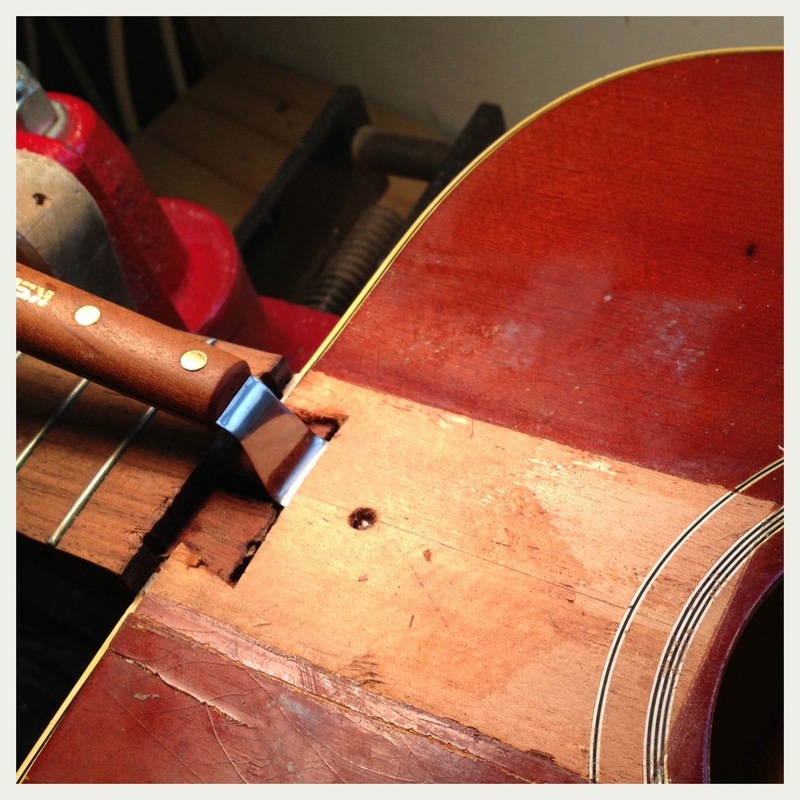 In guitar repair circles, splines are long (relatively speaking) narrow pieces of wood that are glued into corresponding channels to provide additional strength. The first repair is the important one. Remember these wise words. If the first one fails, it usually complicates any subsequent repair. 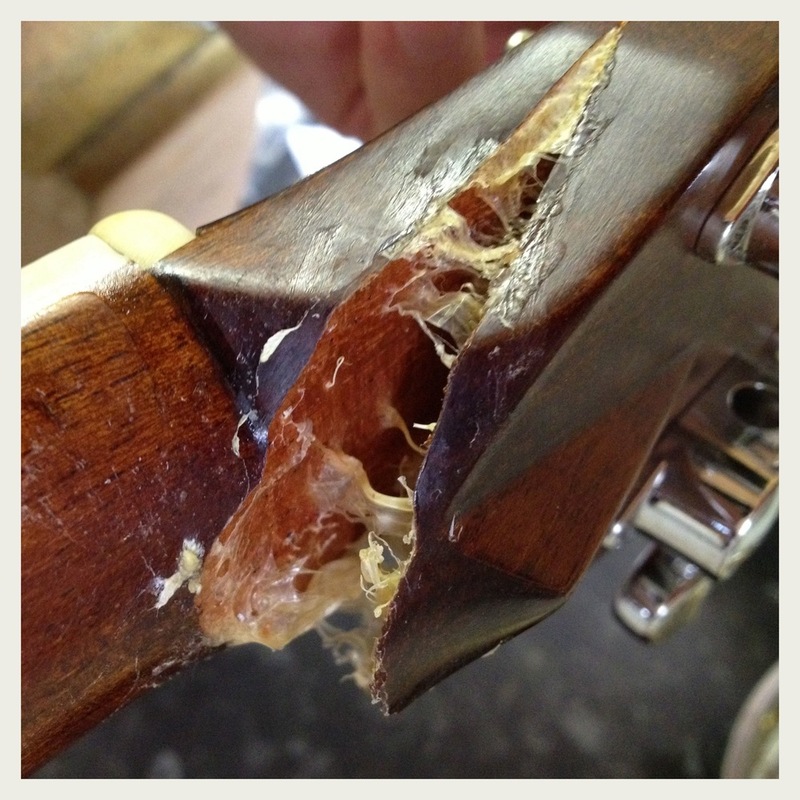 This guitar arrived in the workshop with its headstock flapping about, held on by only some gummy bits of glue. There was a LOT of residue to clean up. Too much, really. Any glue I apply to repair this break needs to make a good contact with the wood. New glue, trying to grip a film of old glue is a recipe for a poor repair. Even after cleaning up much of the earlier stuff, I felt some reinforcement was necessary to ensure a sound and lasting repair. As it happens, the diamond-style volute on this instrument provided me with the perfect idea for reinforcing things. I can rout a channel through that and carve the spline to the same diamond shape. Nice and discreet. Splendid. First up, I have to keep the truss-rod in mind. I don't want to accidentally rout into a hunk of metal. The magnet on the back of the neck tells me where the rod ends. I note that and get on with getting things back in one piece. You can see the diamond volute pretty clearly above. I'm not going to take the whole diamond—I'll effectively rout a channel through it and farther along the neck (past the break). 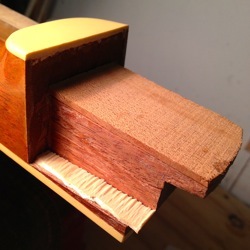 It's an easy job to shape a piece of mahogany (the spline) to fit this channel. Then a little carving will replicate the original shape. Clean up, slap on a bit of lacquer and we should be able to avoid any more strings of gummy glue. We've talked a lot about neck resets over the last few weeks so let's move down the other end of the neck. Headstock breaks. Nobody likes to see it happen but sometimes your guitar takes a tumble and the impact can—all too easily—snap the headstock. 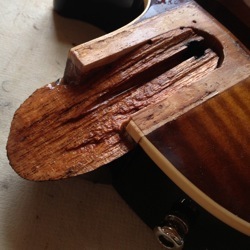 In most cases, this is a (reasonably) straightforward repair and can be re-glued soundly. Sometimes, though, the nature of the damage can force us down a more 'involved' path. If the break is 'short' (i.e. it doesn't provide a lot of glueing area to ensure a sound repair) it may be necessary to consider some reinforcement to ensure the repair holds. One solution is what's called a 'backstrap overlay'. This involves overlaying some fresh wood over the repaired break. 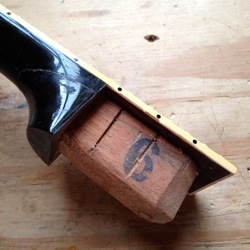 The new wood glues onto the unbroken wood either side of the crack to add strength. Let's take a look at one. In the first photo directly above, I'm repairing the break. This might seem odd but I need to get everything back together properly before I apply any reinforcement. 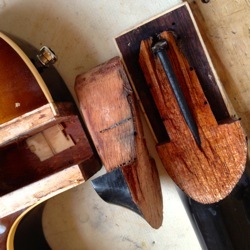 The repair is carried out as it would normally be since the actual re-gluing isn't the real problem—the problem is keeping it in one piece after string-tension is applied. I need to glue-up everything as normal and then reinforce things to ensure the repair is strong. When the initial repair is done and the glue has dried, I can begin the real work on this one. I remove a few millimetres of wood from the rear of the headstock and, past the break, along the neck. It would make for a more discreet repair if I brought this all the way to the end of the headstock but, on a Gibson, I like to stop short of the serial number. If the guitar is ever sold on, a perspective buyer may be put off more by the lack of a serial number than a well-executed repair. The photo above on the right shows the removed section. I'll inlay the new wood here so let's get on with that. 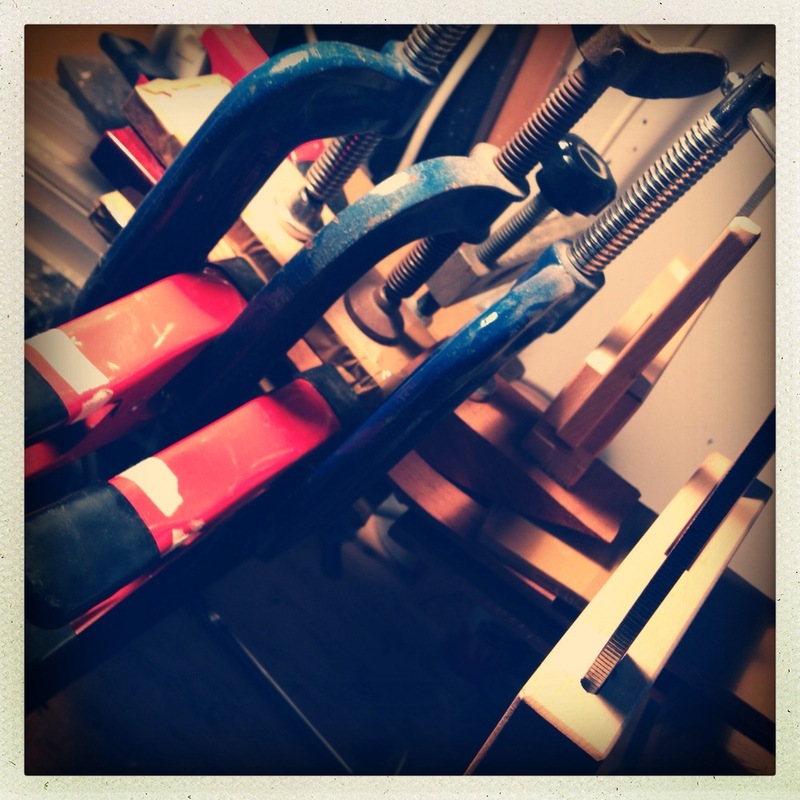 The wood to be overlaid on the headstock is thicknessed and cut to the rough dimensions. 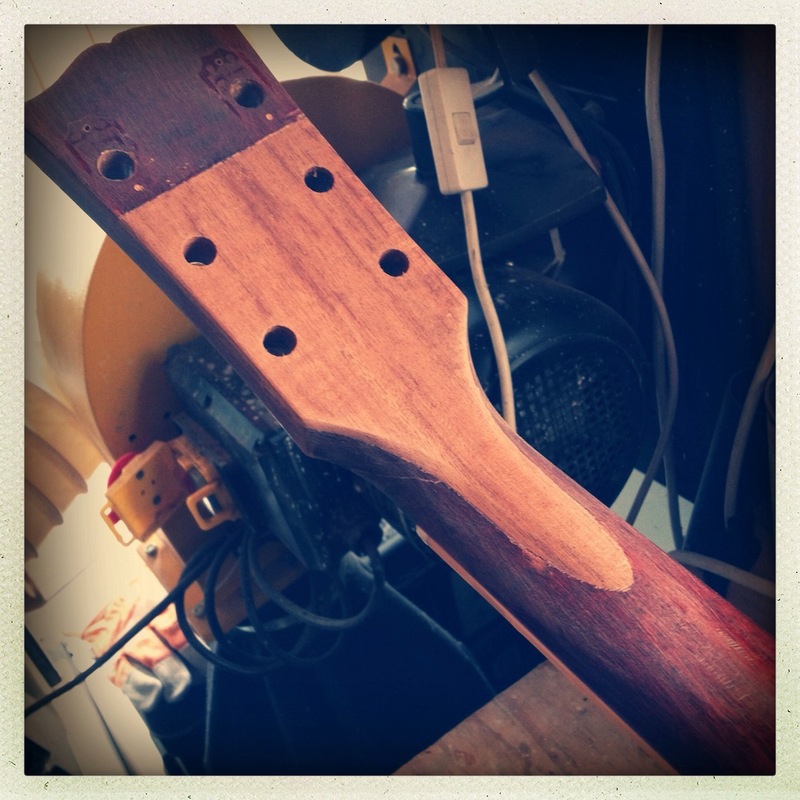 To accommodate the angle between headstock and neck, I bend the new wood. It's this bending that adds extra strength to this repair as the wood grain curves to the correct angle. Repairing guitars often makes for some intricate clamping setups and overlays are prime culprits. A shaped caul is useful to get the wood in that curved bit glued in properly. The roughly shaped wood overlay is pretty obvious (and pretty ugly at this stage) in the photo on the right. This is where things take shape (pun intended). The overlay is cut to shape and the tuner holes drilled. At this point I can go through the usual finish prep. Grain-filling, sanding, etc. In cases like this I need to match the colour of the original finish on the newly overlaid wood. I also have to manage the transitions between new and old finish carefully to keep things looking as inconspicuous as possible. Sealer, colour, and a number of clear-coats later and I'm ready for the next step. The last word on neck resets for a little while. We've had the theory. We've had the straightforward neck set on a Martin and we've had the Martin neck reset that fought back a little. Let's take a look at a neck reset that threw up some curveballs along the way. 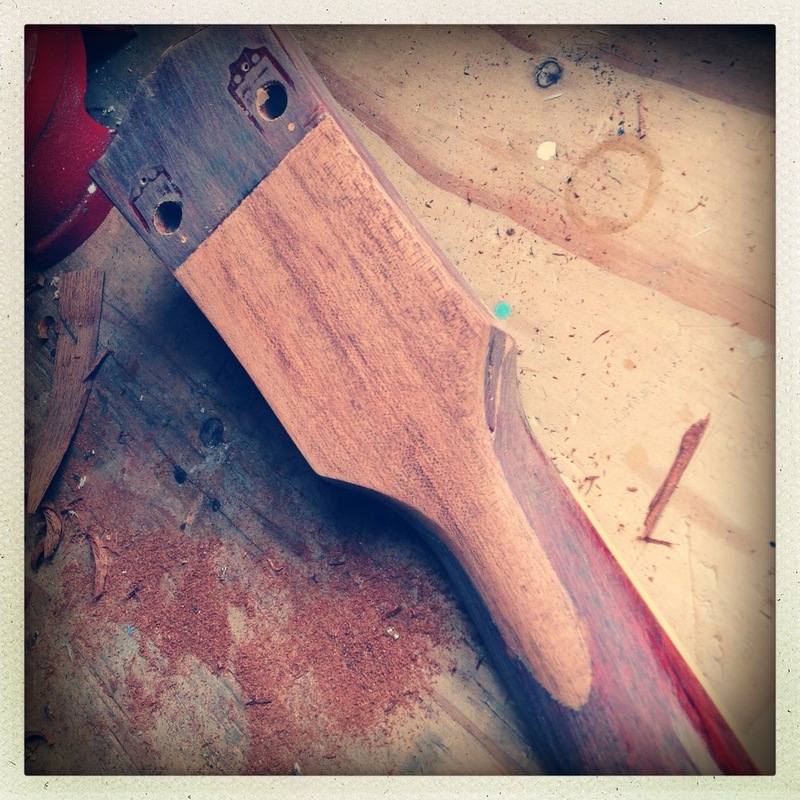 On a Gibson acoustic guitar, the job of getting the neck off is generally a little more work. As well as glueing the actual dovetail joint, the folks at Gibson also apply glue to the surfaces between the neck-heel and body-sides. 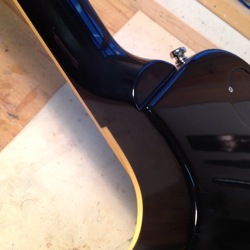 Also, they glue the neck in and then lacquer neck and body together. 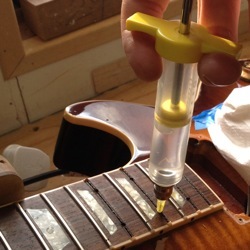 This means getting through the lacquer safely when removing the neck, and—more often than not—means some light finish repair work after it's all reassembled. 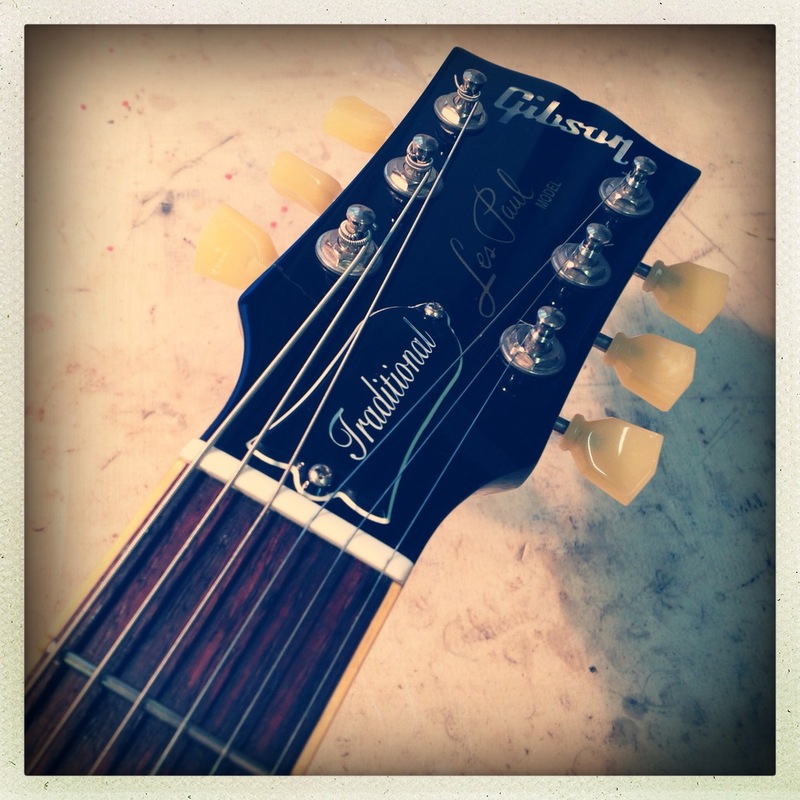 A Gibson is more work to reset but is still generally straightforward. First up, this guitar has a couple of longitudinal cracks in the top. These have been there a while and have had a previous repair before I got the guitar. I check the repair and it seems sound so I move on. I also note that there is a small gap between the bottom of the heel and the body-binding. I can't tell too much about this now and it's clearly been there for some time so I pop it in the mental notebook. I won't go into detail as I've covered much of this before. I free up the fingerboard extension, drill my steam access hole and get to work. As soon as I give the instrument its first 'encouragement wiggle', I can tell that something is wrong. After some investigation, the issue becomes clear. 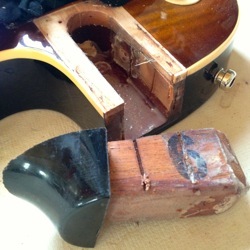 The neck block (the solid hunk of wood that supports the neck inside the guitar) has become loose. The guitar's top and back are no longer glued to the block and any pressure I might apply to remove the neck is also going to push the block up against the top until it breaks. It seems likely that the existing top cracks happened either because the block was loose and not properly supporting the top or (more likely) occurred at the same time as the block became loose—probably in a fall. Either way, I don't want to make things worse. You'll notice in the photo above right that I've removed the fingerboard extension (and that palate knife shouldn't be able to slide in like that). However I proceed on this job, I need to re-glue the neck block but I'm now concerned about unduly stressing this guitar top any more than is completely necessary. 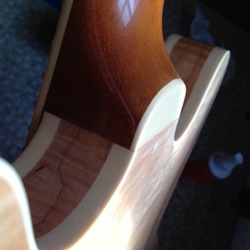 Removing the fingerboard extension will allow me to support the top as I remove the neck. You can see that support in the photo on the right. The dovetail-shaped slot cut in some plywood lets me ensure that the top doesn't move as the neck joint is separated. That separation is a slightly slower job now, and a more careful one. Once the neck is out and I've cleaned up the joint, I can glue the fingerboard extension back on to the neck (using a sliver of rosewood to take up the space of the fret-slot I used to cut through. This slot will be re-cut after things are back together. I go though the normal neck reset process from here. This Gibson has one more curveball to throw at me though. As I alter the neck angle, the bottom of the joint becomes looser in its socket than I'd generally have expected (a little is quite normal). Turns out, this dovetail's not the best fitted joint I've ever seen. The dovetail (the male part of the joint) is quite a bit shorter than the socket it mates to. I'm going to hazard a guess that this may have contributed to that little gap between heel and body-sides I mentioned earlier. Not a major problem. Some shimming is pretty much always necessary during a dovetail reset. Done properly and I've got a heel that contacts perfectly all around.